Having won 15 Stars on their class chart for the month of March, the student’s voted on a class party for their reward! As we are a very active school, the children overwhelming voted for a Sports Themed party! Children were allowed to play with all the school PE equipment and bring in their own items from home! The children created some very interesting obstacle courses, some children played dogdgeball while others played football. Darrell brought in his hoverboard and even Mr. McCartin had a go…although he didn’t make it very far…It’s a lot harder than it looks!! World Champion Kickboxer Caradh O’Donovan visited our School on Wednesday the 3rd of April 2019. Cara put us through our paces in an intense circuit training session and afterwards spoke about her journey to the World championships in a whole school assembly. To take part in this initiative we had to do some fundraising. All money raised goes towards the Sports For Schools Initiative and some new equipment for our school!! Ulster Rugby Visit Our School!! We had an amazing day on Wednesday the 20th of March 2019!! Ulster Rugby players, Tommy O’Hagan, Ian Nagle and Sean Reidy, along with Coach Jon Watt from Virginia Rugby Club gave Ms. Sullivan’s 4th class a master-class rugby training session!! The Active School Committee welcomed the VIP guests into the school and after some introductions it was down to business!!! Coach Jon divided up the class into small teams and each professional joined a team. The coach first went through some practice drills with the children and then they played mini games. The professionals were on hand to give their expert advice on tackling and scoring a try! After the training session, the players chatted with the children, answered all their questions and signed autographs. They were also very impressed with the children’s projects on Ulster Rugby and autographed them!! We would like to say a big ‘THANK YOU’ to Ulster Rugby, Kingspan and Northern sound for running this amazing competition and coming to our school!! Have a look at some of the photos from this brilliant day in the slide show below. Cheiliuireamar Seachtain na Gaelige ar scoil ó 11ú lá de mhí Márta go dtí an 15ú lá. D’eagraigh Club na Gaelige a lán eachtra spoirt le haghaidh gach rang i rith na seachtaine. De Ceadaoin an 13ú lá de Máirt Bhí toraíocht taisce againn as Gaelige. Bhí orainn leid a reigtigh agus an chairt a criochnaigh taobh istigh de am airithe. Bhí mhor an sport againn ag rith timpeall na scoile. Tar éis na tóraíochta taisce rinne Ms. McKay coirpoideachas as gaeilge linn. Rinneamar gróigeadh, seac léimní agus bogshodar! Bhaineamar an taitneamh as! Ar an Aoine bhí ár gcéilí bliantúil againn. Bhí an seachtain ar fheabhas. Féach ar cuid de na pictiuirí thíos! Darragh and Bronagh from The Active School Committee used the trundle wheel to measure the distance of our new ‘Walk Way’ in meters. The total distance came to 258m. Eugene our caretaker will be putting up the new plaques over the Easter holidays so it’s ready to use for all classes when we come back to school. Ulster Rugby Master Class Training Session!!! News Flash!!! We received amazing news this week!! Ms. Sullivan’s 4th class won a Rugby Masterclass training session with the Ulster Rugby team!! The competition was run by Northern Sound in conjunction with Ulster Rugby. To enter we had to write why our school deserved to win a training session with the Ulster Rugby Team! Members from the team will be coming to visit out school on the 20th of March from 2 – 3pm. We were so surprised and delighted to win and are really looking forward to learning from the best!! We will post up pictures of the event so stay tuned!! We celebrated World Book day in school on Thursday the 7th of March 2019. Sporting biographies and annuals are always a popular reading choice. Have at look at some of the children who dressed up as their favourite sports persons, including boxers, football players and rugby players! Students in Ms. Sullivan’s 4th class and Mr McTeggart’s 5th Class are taking on the ’60 minutes a day challenge’ this term. The World Health Organisation recommends that all children and young people get at least 60 minutes of physical Activity a day. We will chart our progress during the week and let you all know how we get on! Our Be Active After School Activity Programme has started up again for the next 12 weeks with Ms McDaid and Ms Connolly’s Second Class. The Be Active After-School Activity Programmme (ASAP) is supported by the Health Promotion and Improvement Department of the HSE in conjunction with Sport Ireland and St. Patrick’s College. Be Active introduces children to fun physical activity in a safe, familiar, structured setting, with an emphasis on enjoyment, learning and variety of activity. The programme aims to improve the attitudes of both children and their parents towards physical activity and lay the foundation for positive, lifelong physical activity habits. The Be Active ASAP is designed for seven/eight-year-olds and takes place for approximately 50 minutes immediately after school on a selected day every week throughout the year. We signed up to the Aldi Rugby Competition and are collecting stickers of famous Irish Rugby Players! We could be in with a chance to win €50,000 to develop our school playing facilities. Also a primary school in each province will receive €2,500 worth of training equipment for their school, a training session with Paul O’Connell including a new set of school jerseys and Aldi branded water bottles. Every school who enters a fully completed poster will receive an Aldi Play Rugby kit bag, 4 rugby balls, a water bottle holder and 6 water bottles. These are brilliant prizes so fingers crossed!!!! Update 26/2/19 – We did it! Thanks to all the parents, teachers and children who helped our school collect stickers for the wall chart! We can now send the completed poster back to Aldi to be entered into the competition! Everyone enjoyed Mr O’Connor and Ms. Murphy’s 3rd class performance of “Bábóg Siorc” (Baby Shark in Irish!) at the January assembly, complete with all the actions. It was a fun and lively way to start the assembly and incorporate physical activity into the monthly performance! Our 5th and 6th class girls had an enjoyable weekend participating in an u13s camogie tournament in Killinkere on Sunday February 10th. The girls showed great determination, sportsmanship and encouraged each other throughout the games. Thank you to the parents for their support also. We are very proud of their hard work. Our next tournament is on Sunday 10th March. On Wednesday the 6th of February the Active School and Green School’s committees joined forces to host our first WOW day of 2019! As usual we had a fantastic turnout! Thank you to all the parents and grandparents who joined us on our walk to school! We are continuing our ‘Active Lines’ for the 2018 – 2019 school year. Children complete different exercises while waiting in line for their teachers to collect them from the yard. We have ‘Active Line’ posters on display at the doors leading out to the 4 different school playgrounds so that teachers and students know what activity is planned for that day. Teachers can also add to the exercises and change them up to keep them fun and fresh! Take a look at Mr. O’Connor completing some active line activities with the senior classes. Our Fun Fitness Fridays are back in action for 2019! We are delighted to have our GP room back in action and, every Friday from now until the Summer Holidays, our Hall and Yard are zoned off to allow each class an opportunity to play with our fantastic PE Equipment. Click into the link below to see the rota and find out when your week is! Check out what Mr. Smith’s class got up during their ‘Fun Fitness Friday’ slot!! 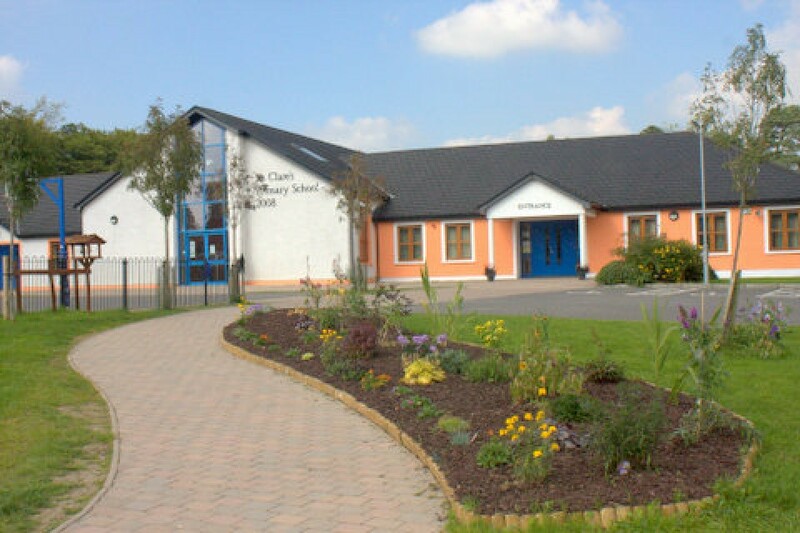 St. Clare’s NS has put in place the ‘Do Your Talking as You Are Walking’ initiative. For the less active children who participate less in running or physical games at break times, this enables them to be on the move while chatting with their friends. Since starting the Active School process we have put in playground trails on Junior and Senior yards, which has had a big impact on physical activity during break times. St. Clare’s 5th and 6th class girls have been training for camogie every Thursday for an hour over the past few months. Some of the skills that we have been working on include; ground striking, dribbling, blocking, ground tussle, ball control and goal shotting practise. We will soon be moving onto roll and jab lifts, handpassing, soloing and striking in the air. We are looking forward to participating in updoming camogie tournaments. Short physical activity breaks throughout the day, for example, at the beginning or in the middle of class, can help students meet the goal of getting 60 minutes of physical activity each day and can get everyone energized and moving. Research has also shown that short bouts of physical activity can help with attention, memory and understanding. The Victorious Castlerahan team visited our school after their historic win against Crosserlough in the Cavan County Final. After their 4th final in a row, they brought home the silver!! Well done to all the lads, many of whom are former pupils of St. Clare’s!! Physical activity is equally important for mental well-being as it is for physical well-being. For wellness week, all classes enjoyed some mediation and gentle yoga exercises in class. Check out our Junior Infants doing their yoga exercise and having some mediation and relaxation time. We absolutely love our annual Halloween Disco. If the weather is good, its held on the senior yard and if its raining it takes place in the hall. We come to school in our spooky costumes and dance away the cobwebs…literally!! A Maths Trail is an organised walk through an area close to school where pupils can experience maths in the real world. A trail will help to highlight for them the huge use we make of numbers in our everyday life and how maths surrounds us in even the most unusual areas. Its a great opportunity for the integration of Maths and PE as children get the opportunity to solve mathematical puzzles through completing orienteering and outdoor challenges. Its also great for learning the skills of team work and cooperation. This is our second year running a maths trail activity and the children really enjoy it. The Active School Committee surveyed the students of 6th Class in early October to find out what activities they would like to try for Active School Week 2019. The results were pretty conclusive!!! Archery was a huge success during Active School Week last year for the outgoing 6th class and the current 6th class students voted very strongly for it again this year. We hope to arrange it again and will be contacting the ‘Cavan Archers Club’ in due course. Cycling was also a very strong choice for the current 6th class. We will contact cycling Ireland and The Cavan Sports Partnership for further information on running a cycling initiative in school.